Saturday we had "dudes day out." Joy had gone shopping with her mom and left me with the boys. This has only been the second time where I had been with the boys solo for an extended amount of time. It doesn't count when Joy goes to pick up her mom, even though it's about 40 minutes till she gets back. I got up early to get the dishes and laundry going so I wouldn't have to worry about that later or rushing to get it all done while they nap. We started off with a little movie matching. I put on the cartoon channel but quickly decided we should watch something with music in it. I put the Blues Brothers in. We then had breakfast while that was going. The boys liked the music and Jasper was making weird faces when they went to visit the nun. After breakfast, I put the boys into the stroller and we walked to the library. On the way we talked and sang. We also pointed out the trees and I named things along the way. We got to the library and I picked out a bunch of kids books that I think would benefit the boys in a way that they could interact with. I got a baby book on body parts, smiles, hugs, zoo animals and bunch more. The boys loved walking down the aisles and grabbing books off the shelf. I quickly had to stop them though. All in all not much mess made. On the way back home, I was telling the boys that mommy was shopping with grandma. I noticed Jasper hunched over to the side of the stroller with tears in his eyes. I think he missed his mommy. So I picked him up and held him as I strolled Jacob back home. Jasper cheered up quickly. When we got home, I got the boys water and we hung out in the dinning room reading books. They especially loved the book on hugs. Jacob sat in my lap and without warning I got lots of hugs. 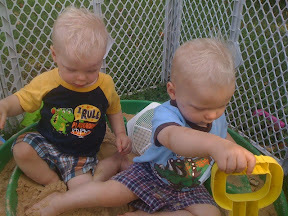 After reading I took the boys outside to their sandbox. I put pandora on my phone and we danced some. The boys played for a little bit and pulled some dead branches down not far from them. After the sandbox we had lunch and then I gave the boys a bath/shower to get the sand and food off of them. We concluded "dudes day" with nap time. After nap time, we all headed up to willoughby to visit my grandma in the nursing home. The boys lightened up everyone's day. They got my grandma to leave her room and we went into a community room where there were birds. My grandma loved seeing the birds. We then visited my sister for her birthday.